Please pray for Samuel and Miklos, our two UK vocations beginning their Second Year at our two seminaries. They have completed their First Year and will be incorporated into our Fraternity tomorrow, Saturday 20th October. 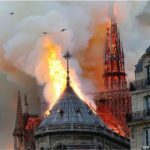 Please also pray for Ciall, another Irish-English vocation, who would have been with them but had to leave seminary for health reasons last June after a successful First Year. 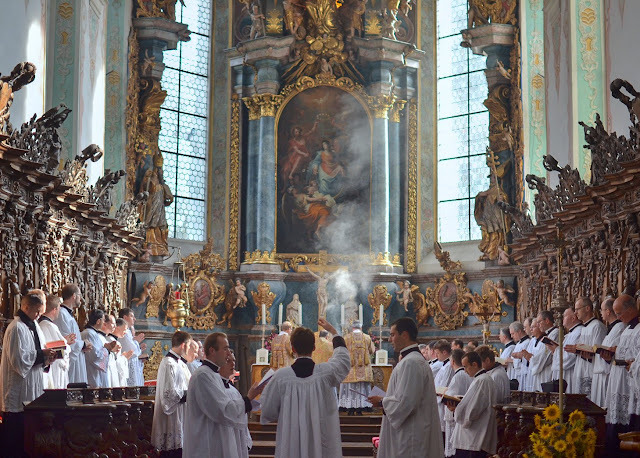 Tomorrow, 25 young men altogether will receive First Tonsure and the cassock from the bishops, both in Wigratzbad, Bavaria, and in Denton, Nebraska. In total, 39 young men were admitted into our two seminaries this autumn. Many more applied but were not accepted. 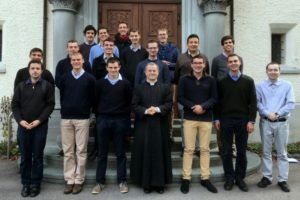 24 First Year seminarians entered Wigratzbad this month, including: 9 French, 4 Portuguese, 3 Canadians and 1 Colombian in the French-speaking Section; and 2 Germans, 1 Austrian, 1 Hungarian, 1 Icelander, 1 Pole and 1 Swiss in the German-speaking Section. We will soon announce our next Vocation Discernment Weekend in Warrington.